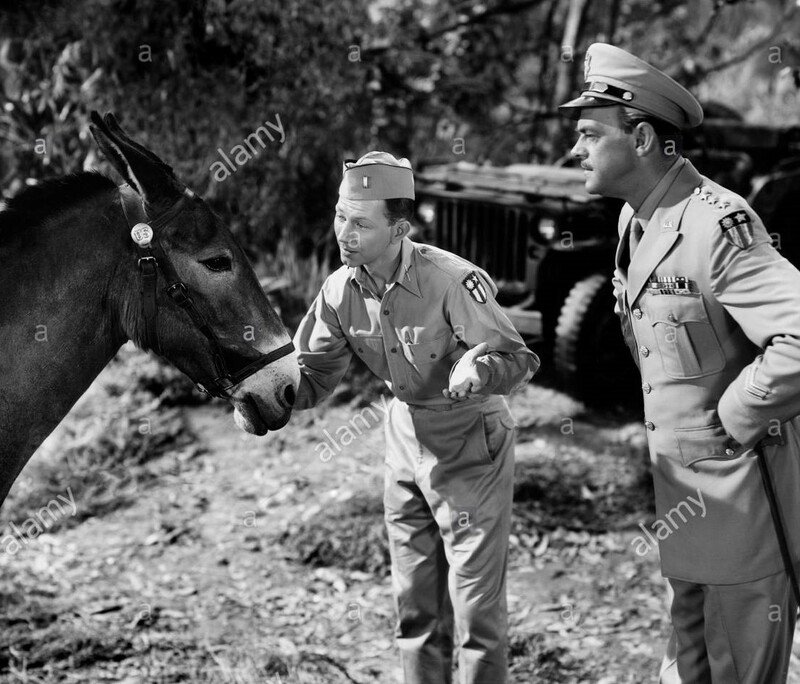 This Universal International production from house director Arthur Lubin launched the unlikely comedy of duo of Donald O’Connor and a Mule who just happened to have a voice that sounded exactly like character actor Chill Wills. Honestly, a heck of a casting coup. The pair would team for a total of six films together in as many years. Yes it’s the era of WW2 so don’t expect any political correctness on the part of our talking jackass. Cut to an army hospital where O’Connor innocently speaks of the talking mule who saved his life. In come the psychoanalysts and O’Connor is weaving baskets in the psych ward where nurse Zasu Pitts is keeping watch. 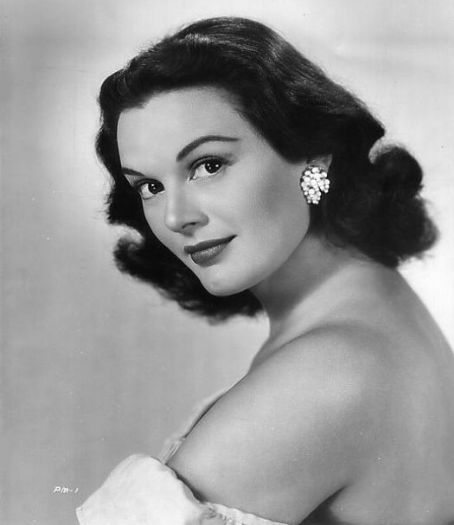 O’Connor knows what he saw and heard but changes his tune so he can get back on active duty where he’ll pal around with a young Tony Curtis and quickly become infatuated with Patricia Medina who is seeking refuge in the army camp. Commander Ray Collins assigns his young Lt. to the intelligence core and with the talking mule feeding O’Connor vital information on Japanese plans and locations, O’Connor is becoming the star officer under his command. That is until he demands to know where the intel has come from. 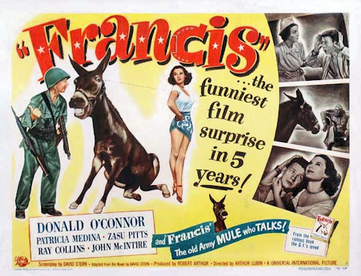 Yup, O’Connor again confesses it’s a talking mule who is turning him into a military genius. Back to the psych ward where Zasu continues to dote on her brave little Lt. with the talking mule for a friend. Soon Francis will let O’Connor in on the fact that the Japanese are intending to launch a full out attack on the camp. O’Connor puts his career on the line but will convince Collins to evacuate and when it all comes true, O’Connor is again basking in the glory he doesn’t want and again it’s his confessing that his friend Francis deserves the credit that lands him back in basket weaving 101. It’s not surprising that this comedy farce found a home and was a hit with movie goers. The first two thirds moves along at a fun pace but it’s when General John McIntire turns up that it takes off into flight. McIntire plays his role of the military brass leader with a straight face and the film is that much better for it. He’s embarrassed by the fact that he’s facing off against a military mule and attempting to coax him into a discussion. McIntire and Chill Wills’ voice going toe to toe are for me the highlight of the film. The script is full of double meanings that are sure to elicit smiles and outright chuckles. For example…. Francis would spawn a number of sequels, six in total. 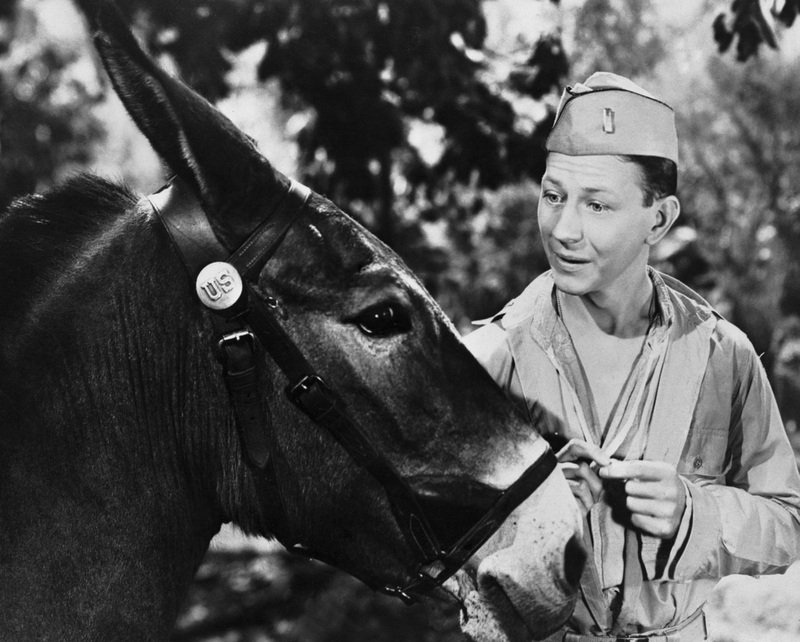 The first five of which cast the Chill Wills voiced Mule opposite Donald O’Connor. 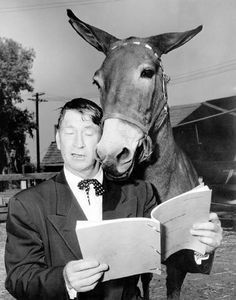 True or not I’ve heard it said that O’Connor refused to do any more talking mule pics after learning the mule received more fan mail than he did. Could that be the reason why Mickey Rooney stepped in for the swan song, Francis In the Haunted House? One thing that should be commended with the Francis series is that they proved to be a training ground for plenty of Universal International’s up and coming actor’s and actresses who were being groomed for stardom. Some of whom would go on to becomes as well known or even more so than O’Connor. Among the many who apprenticed in the series aside from Tony Curtis you’ll find, David Janssen, Julie Adams, Piper Laurie, James Best, Mamie Van Doren, Martha Hyer, Timothy Carey and even a young tall skinny guy by the name of Clint Eastwood made an appearance. And of course our leading lady in this series opener, Miss Medina. Of the seven films, Arthur Lubin would direct the first 6 that starred O’Connor while Charles Lamont would step in to direct the final entry with Mick. Easy to take, these films are entertaining as a whole and can easily be picked up in a DVD set that features all seven films in the series. 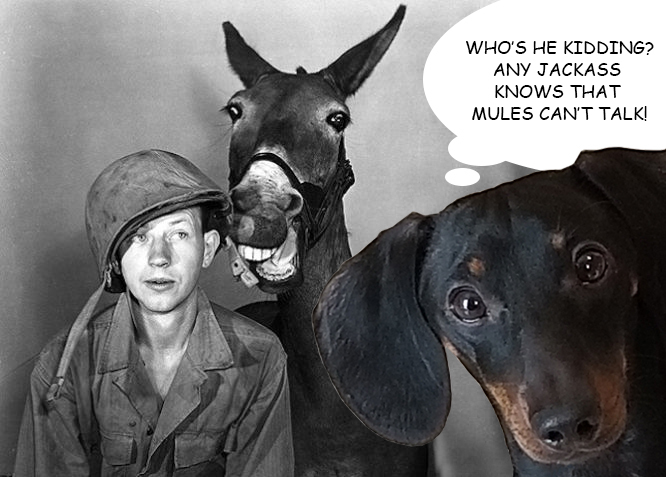 And what does Brando the Weiner Dog think of Donald O’Connor and his talking mule? Here’s what he had to say when I posed the question to him. Gosh, it’s an age since I have seen any of these. Lots of fun . 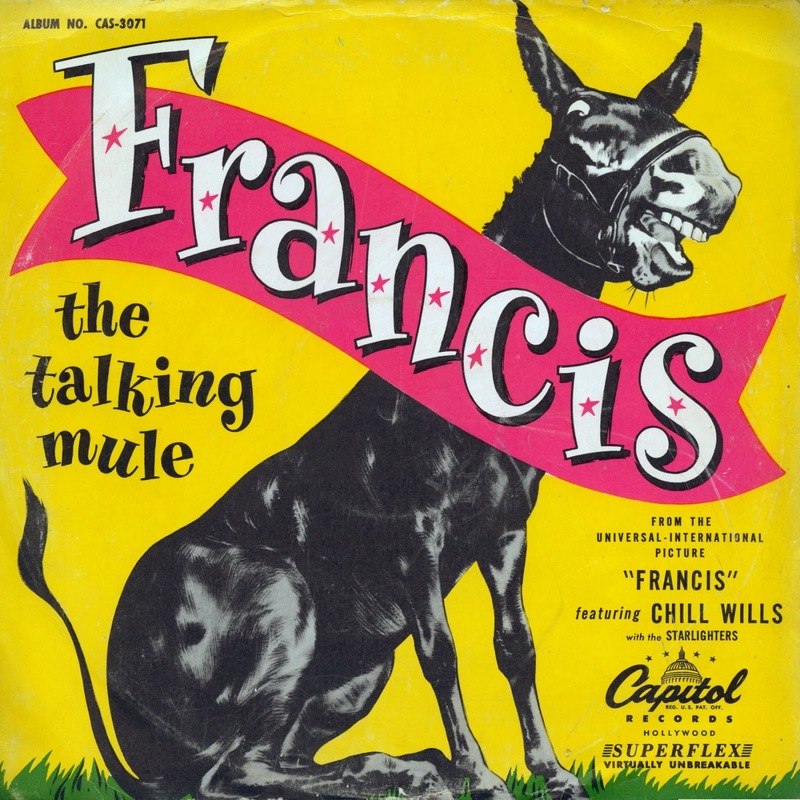 Chill Wills the perfect voice for Francis. And as you say, so many actors to recognise in the films. I love that photo of Brando and his comment. Superb! I love those films and generally most of the Universal-International products of the era. Ma and Pa Kettle, the sci-fi craze, the westerns they were banging out and all those Tony Curtis and Rock Hudson vehicles designed to raise they’re box office appeal. It must be close to 40 years since I saw these films! I remember having a lot of fun with them back when I was a kid and they showed u on Saturday afternoon TV. I’d say you are long overdue for a revisit to simpler times and comedy. You make a good point about these movies being a good training ground for up-and-comers at Universal. I quite like Donald O’Connor as the hapless soldier in this film, but I have to say I can barely stand Chill Wills as Francis. However, that’s why they make pencils with different colours, right? Also: Brando is as cute as ever. Absolutely. 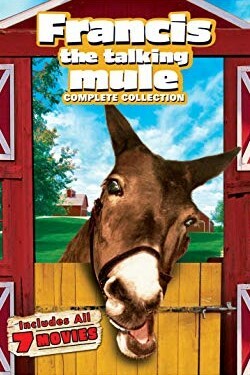 Funny cause I think if a mule was gonna talk he’d have a lazy sounding voice/drawl like Chill or maybe Ken Curtis or Slim Pickens. Brando has melted my heart and I’m so happy to once again have a dog here in the house. Thanks.